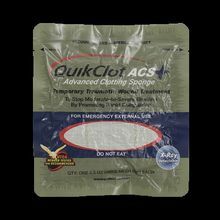 When time is critical, rip open a packet of QuikClot ACS+�, pack the self-contained sponge into the wound and the bleeding stops rapidly. The sponge can be packed to conform to the shape of the wound and is easily removed in the hospital. Each package of QuikClot ACS+� contains one 3.5-ounce hemostatic sponge. Measures 5�"L x �"W x 6Y"H.
Vacuum packed and sterile. Designed to stop moderate to severe bleeding by promoting rapid coagulation. XRay detectable, brief instructions printed on package, For temporary external use.